RSS RSS is an acronymn for Really Simple Syndication or Rich Site Summary. RSS (noun) - an XML format for distributing news headlines on the Web. RSS. 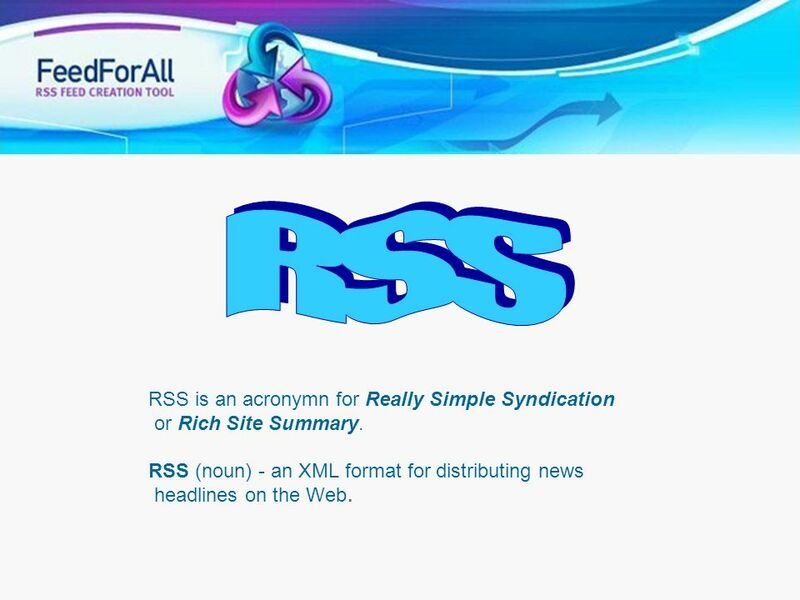 1 RSS RSS is an acronymn for Really Simple Syndication or Rich Site Summary. RSS (noun) - an XML format for distributing news headlines on the Web. RSS is an acronymn for Really Simple Syndication or Rich Site Summary. RSS (noun) - an XML format for distributing news headlines on the Web. What is RSS? Why use RSS? 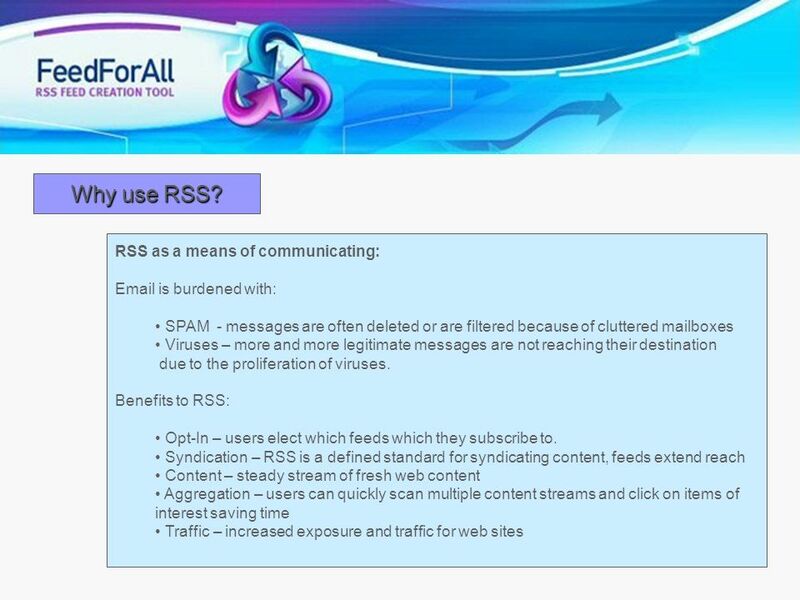 What is RSS used for? How do I create RSS Feeds? How do I view RSS feeds? 3 What is RSS? RSS is a defined standard for syndicating headlines and other content. RSS is created using XML or eXtensible Markup Language, which is a markup language similar to HTML. All fields are defined. Tags are used to denote the field’s classification. Like HTML, proper construction requires that tags are both opened and closed. Example: <title> Title of Item in Feed </title> RSS has been around for more than a decade, but only recently the standard has been embraced by bloggers, webmasters and large news portals as a means of distributing Information, in a standardized format. RSS is a defined standard for syndicating headlines and other content. 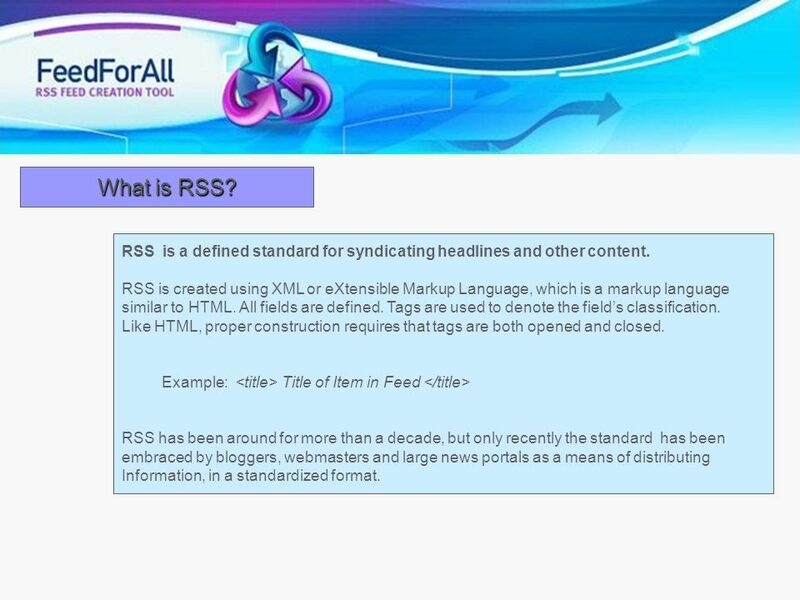 RSS is created using XML or eXtensible Markup Language, which is a markup language similar to HTML. All fields are defined. Tags are used to denote the field’s classification. Like HTML, proper construction requires that tags are both opened and closed. Example: <title> Title of Item in Feed </title> RSS has been around for more than a decade, but only recently the standard has been embraced by bloggers, webmasters and large news portals as a means of distributing Information, in a standardized format. 5 Why Use RSS? This Alexa graph represents traffic increase on Software Marketing Resource. 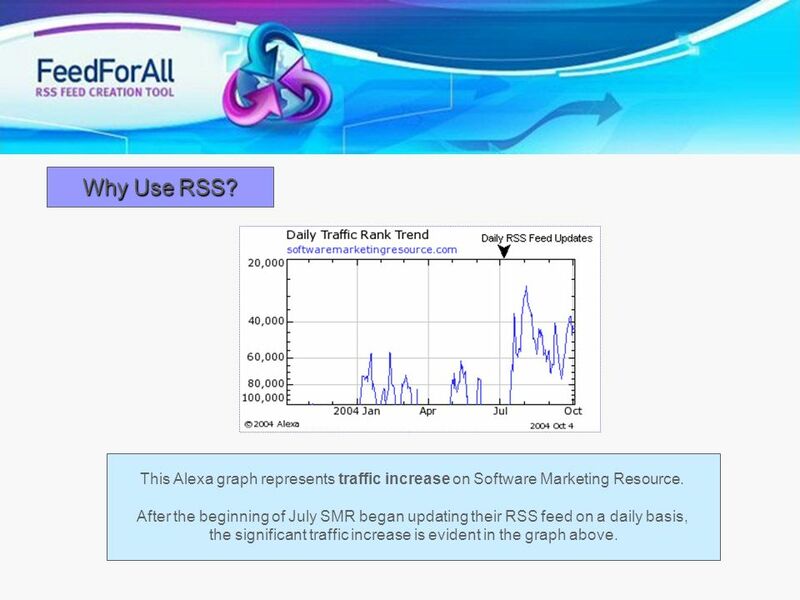 After the beginning of July SMR began updating their RSS feed on a daily basis, the significant traffic increase is evident in the graph above. This Alexa graph represents traffic increase on Software Marketing Resource. After the beginning of July SMR began updating their RSS feed on a daily basis, the significant traffic increase is evident in the graph above. 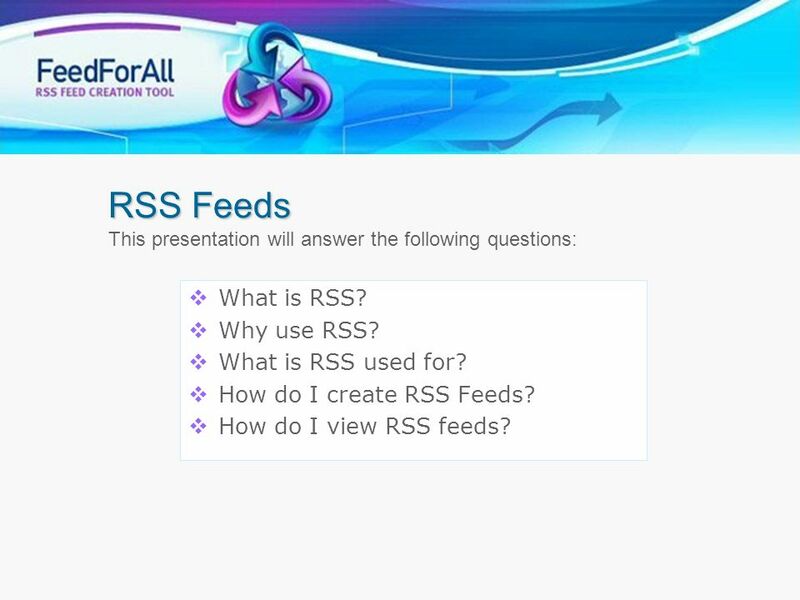 7 How do I create an RSS feed? 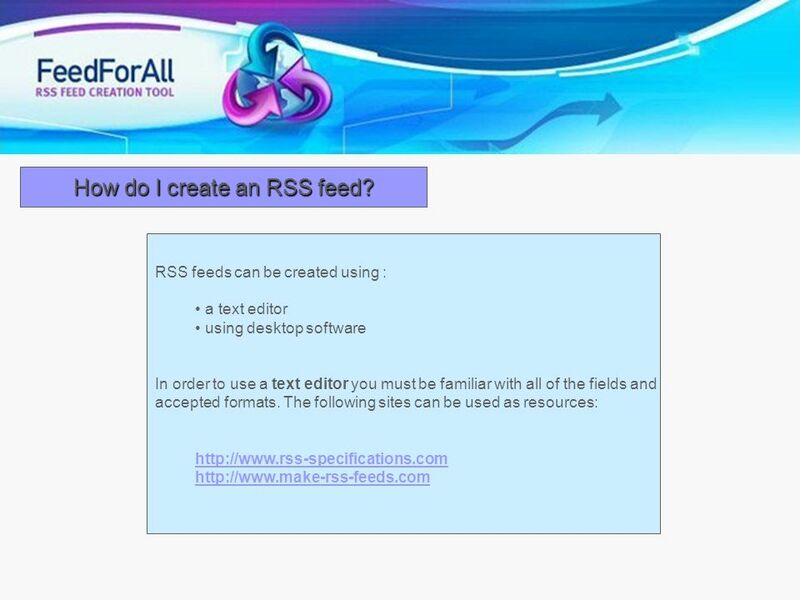 8 How do I create an RSS feed? 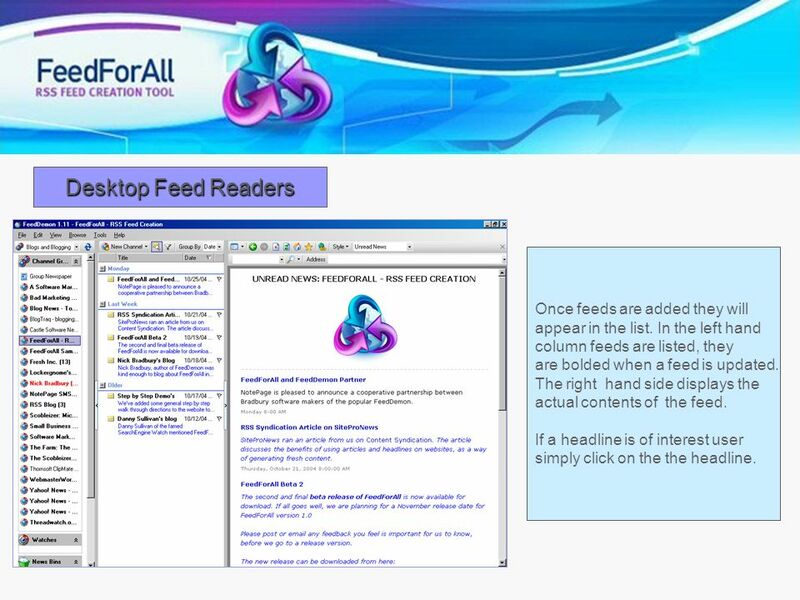 To create feeds using desktop software, you may want to consider FeedForAll . 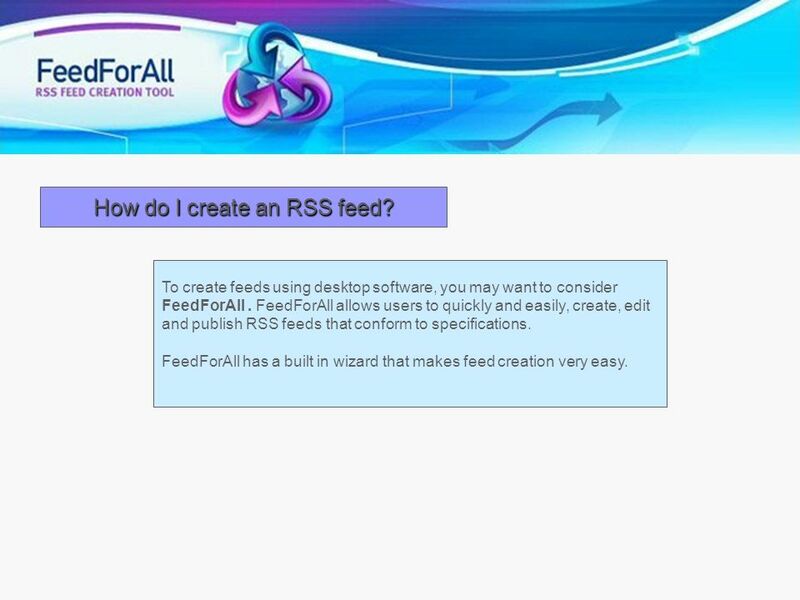 FeedForAll allows users to quickly and easily, create, edit and publish RSS feeds that conform to specifications. 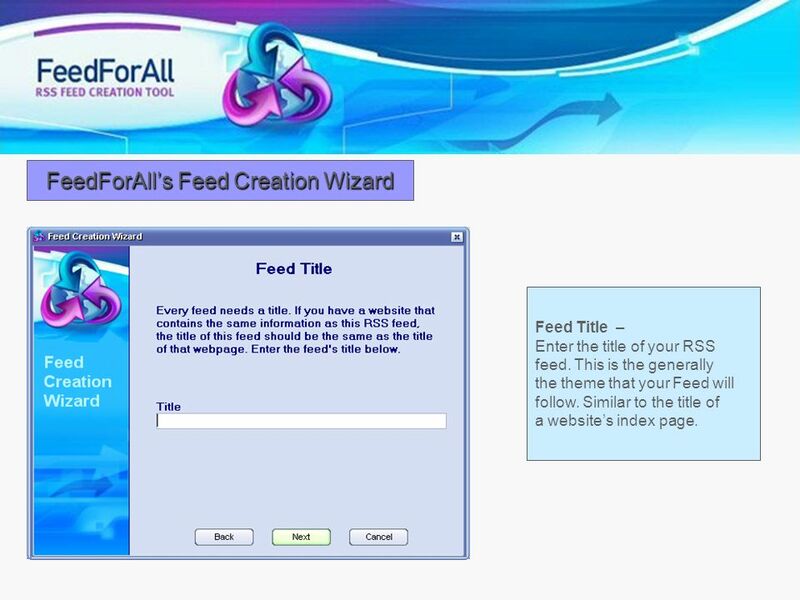 FeedForAll has a built in wizard that makes feed creation very easy. 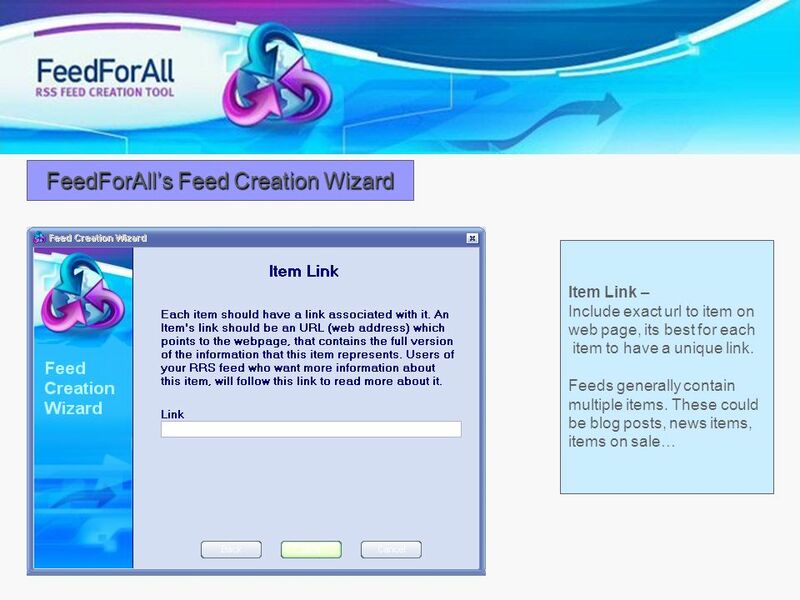 To create feeds using desktop software, you may want to consider FeedForAll . 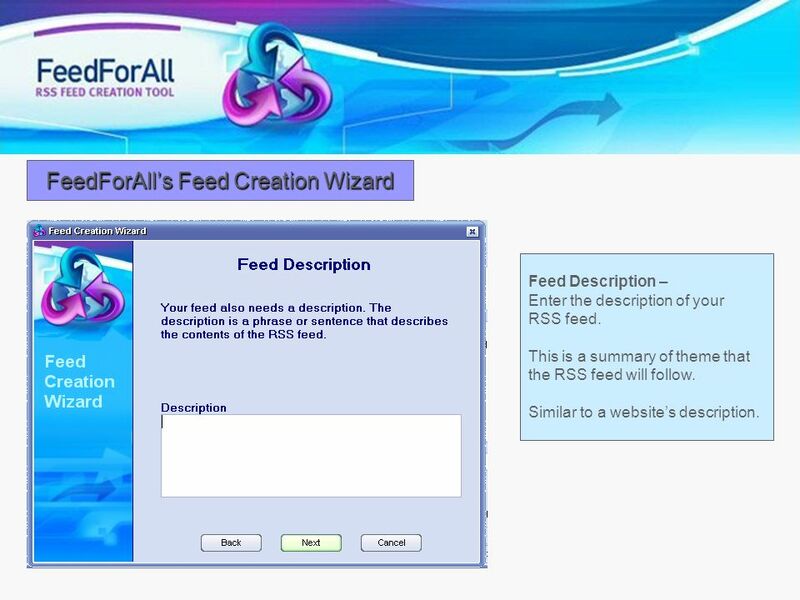 FeedForAll allows users to quickly and easily, create, edit and publish RSS feeds that conform to specifications. 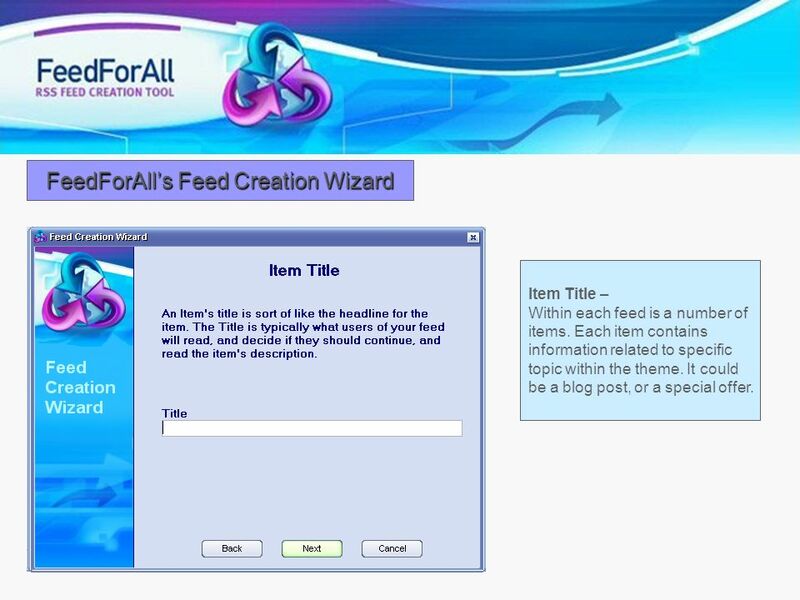 FeedForAll has a built in wizard that makes feed creation very easy. Feed Title – Enter the title of your RSS feed. This is the generally the theme that your Feed will follow. Similar to the title of a website’s index page. Feed Title – Enter the title of your RSS feed. This is the general theme that your Feed will follow. Similar to the title of a website’s index page. 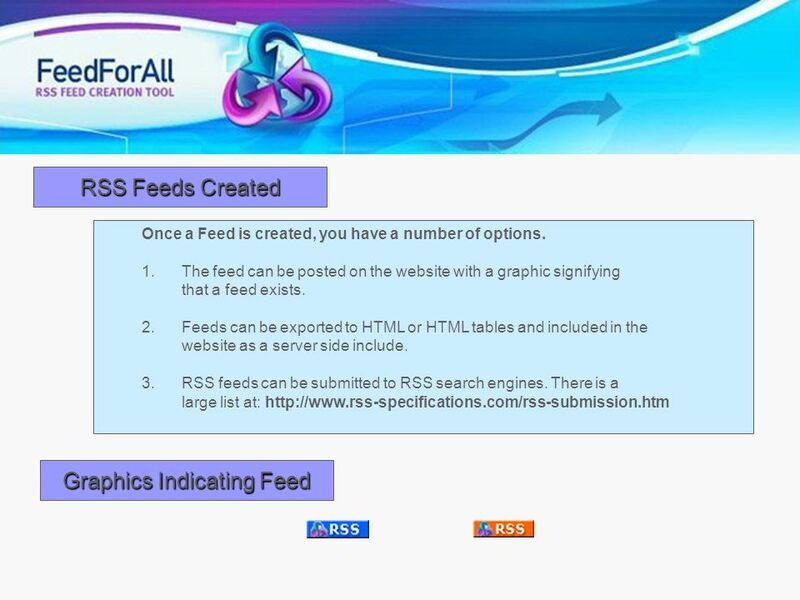 Feed Description – Enter the description of your RSS feed. This is a summary of theme that the RSS feed will follow. Similar to a website’s description. Feed Description – Enter the description of your RSS feed. This is a summary of theme that the RSS feed will follow. Similar to a website’s description. Feed Link – Enter the link of your RSS feed. This is the link of the website containing contents related to the RSS feed. 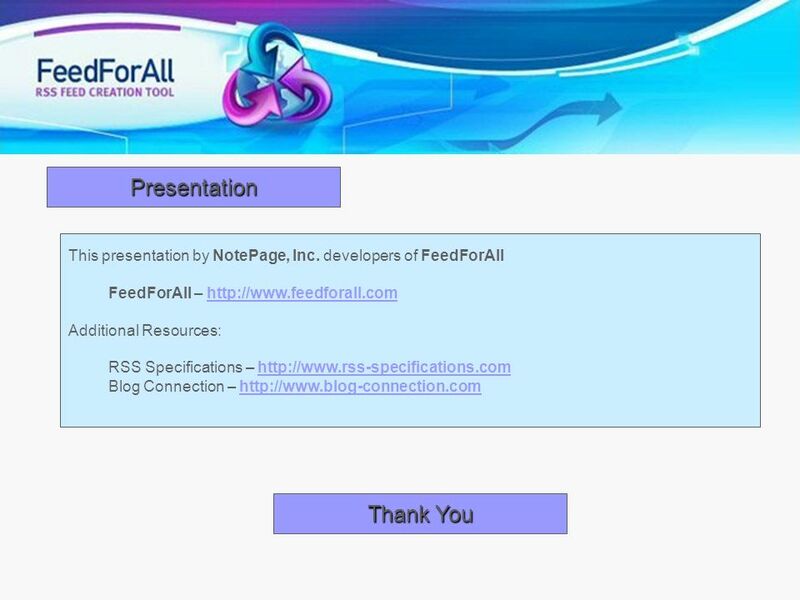 Feed Link – Enter the link of your RSS feed. This is the link of the website containing contents related to the RSS feed. Item Title – Within each feed is a number of items. Each item contains information related to specific topic within the theme. It could be a blog post, or a special offer. Item Title – Within each feed is a number of items. Each item contains information related to specific topic within the theme. It could be a blog post, or a special offer. Item Description – Summary of item. Often this Is an overview or portion of the item. Item Description – Summary of item, an overview or portion of the item. Item Link – Include exact url to item on web page, its best for each item to have a unique link. Feeds generally contain multiple items. These could be blog posts, news items, items on sale… Item Link – Include exact url to item on web page, its best for each item to have a unique link. Feeds generally contain multiple items. Additional information, including images can be added to RSS feeds to enhance them. Additional information, including Images can be added to RSS feeds to enhance them. 17 How do I read RSS feeds? RSS feeds can be read two different ways. 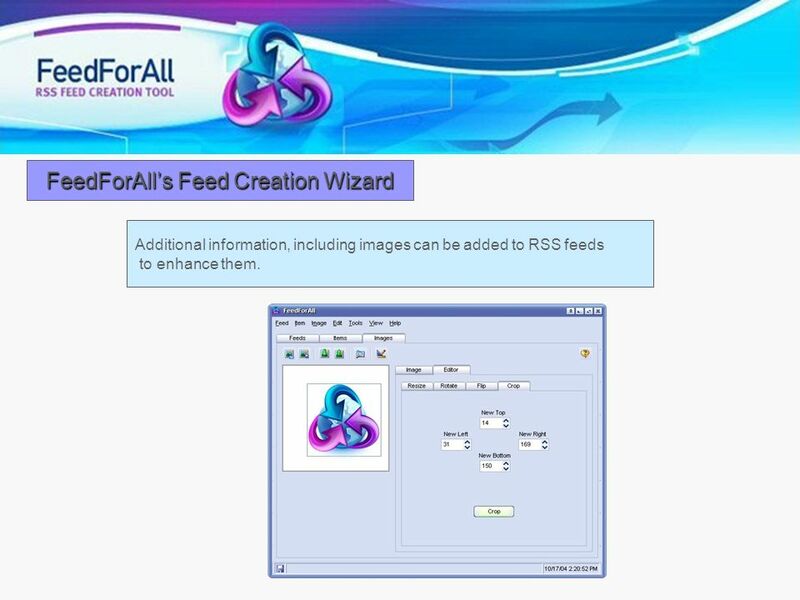 19 Desktop Feed Readers To add feeds, simply enter the url of the .xml or .rss file. The software will routinely check for feed updates, and maybe able to auto-detect sites that have feeds available. 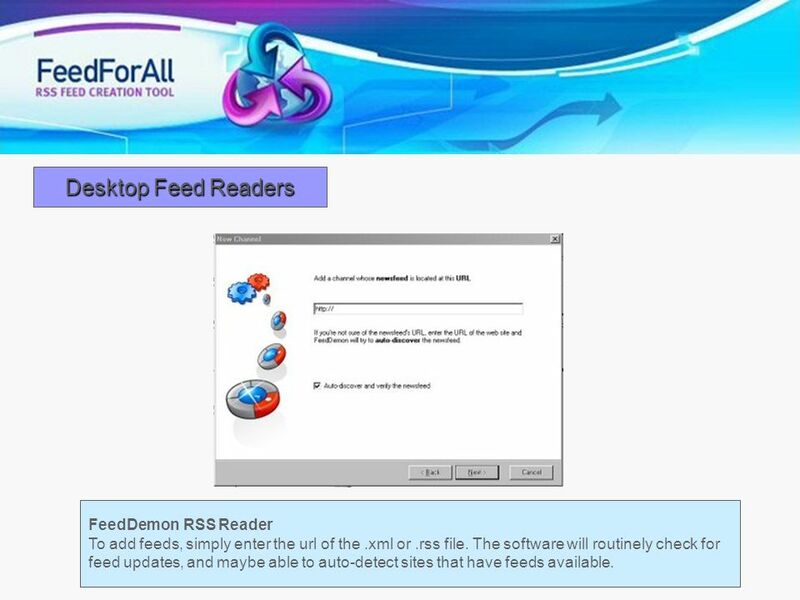 FeedDemon RSS Reader To add feeds, simply enter the url of the .xml or .rss file. The software will routinely check for feed updates, and maybe able to auto-detect sites that have feeds available. appear in the list. In the left hand column feeds are listed, they are bolded when a feed is updated. The right hand side displays the actual contents of the feed. If a headline is of interest user simply click on the the headline. Once feeds are added they will appear in the list. In the left hand column feeds are listed, they are bolded when a feed is updated. The right hand side displays the actual contents of the feed. If a headline is of interest user simply click on the the headline. 21 Web Based Readers Web based readers work similar to desktop clients, they are often designed to be start pages. Simply enter the urls of the feeds you wish to monitor, often they will allow you to determine the number of items that you want to see for each feed. Each time feeds are updated new items will Appear in your web browser. 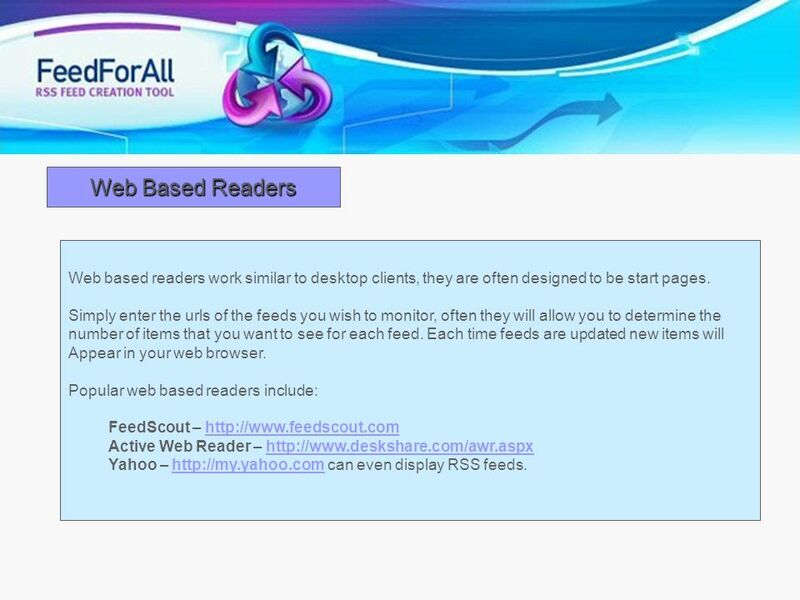 Popular web based readers include: FeedScout – Active Web Reader – Yahoo – can even display RSS feeds. Web based readers work similar to desktop clients, they are often designed to be start pages. Simply enter the urls of the feeds you wish to monitor, often they will allow you to determine the number of items that you want to see for each feed. Each time feeds are updated new items will Appear in your web browser. Popular web based readers include: FeedScout – Active Web Reader – Yahoo – can even display RSS feeds. 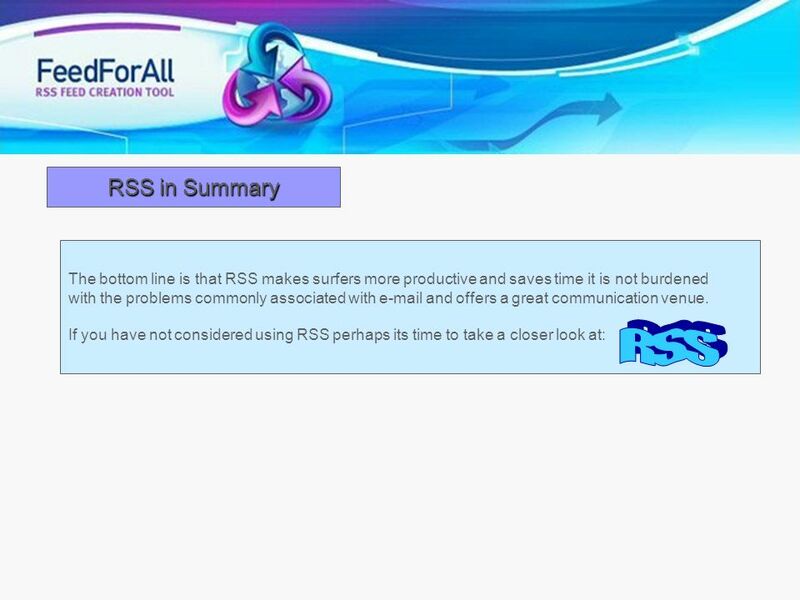 Download ppt "RSS RSS is an acronymn for Really Simple Syndication or Rich Site Summary. RSS (noun) - an XML format for distributing news headlines on the Web. RSS." Wikispaces 101 Training Standards & Interoperability (S&I) Framework May 30, :00 - 5:00pm EDT 1. Creating a Google Site April 2011 Public Computer Center at Moore Memorial Library | Greene, NY. 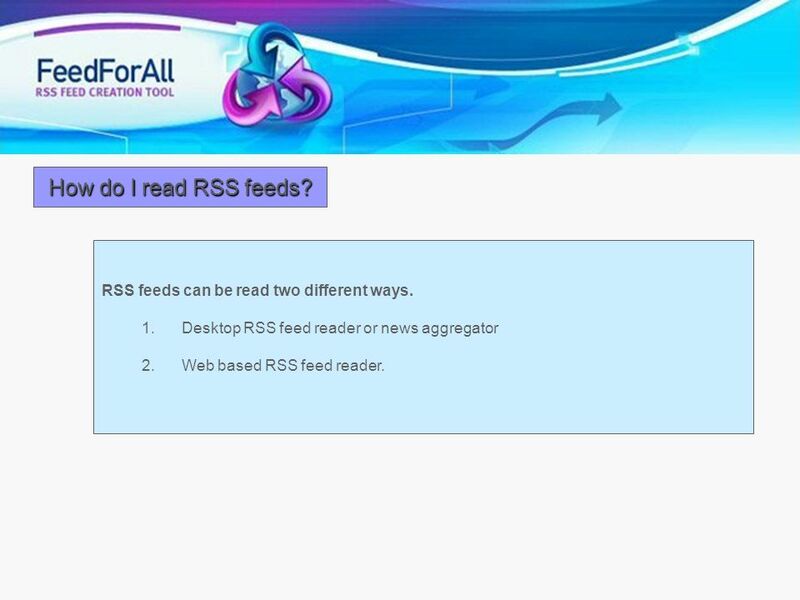 1 Introduction to RSS and News Aggregators. 2 Reading Blogs OK: As a Web page –Must visit multiple sites to check for updates Better: Via a RSS Feed –Updates. Basic Searching Engineering Village. Agenda What is Engineering Village? Setting up a personal account Searching Engineering Village How to. Engineering Village ™ Basic Searching. CHAPTER 5: RSS THE NEW KILLER APP FOR EDUCATORS By: Christina Cameron & Angel Joseph. RSS 2.0: Experience with implementation in a closed Intranet Presented by Mr Ajith Balan Scientific Officer Scientific Information Resource Division Bhabha. IDK0040 Võrgurakendused I RSS 2.0 Deniss Kumlander. Blogs Return on Marketing Investment MARK 430 Week 2 Lab. Sakai Overview ITS Teaching and Learning Interactive Aurora Collado January 10, 2008. CSc 667/867 Java Web Start / JNLP RSS. Deploying Software with JNLP and Java Web Start Delivering client-side Java technology-based programs has recently. CIS101 Introduction to Computing Week 05. Agenda Your questions CIS101 Survey Introduction to the Internet & HTML Online HTML Resources Using the HTML. ***Adding items to your Etudes Homepage*** Log into Etudes https://myetudes.org https://myetudes.org.